« Banned Books Week Party at Brothers 2018! To celebrate Banned Books Week this year, we’re doing banned book-themed bingo night! There will be 6 rounds, all different themes, and one winner per round. Winners will be awarded Strand goodies and prizes. The evening will be bookended (get it?!) by performances by our invited Queen of the Banned, SOL! Darius C. Soler, professionally known as ‘SOL’ is an NYC born and bred entertainer. SOL initially discovered his love for the stage while performing in his church choir and various musicals. He is a graduate of the premier vocal program at the Professional Performing Arts School (PPAS) in Manhattan where he became a classically trained singer and performed at various venues throughout the city with the esteemed Songs of Solomon choir. Following High School, he attended Pennsylvania State University; where he majored in Integrative Arts and became a star soloist with the university’s The Essence of Joy, gospel choir. In addition to his vocal studies, he was also a member of the Urban Dance Troupe as well. Last year, SOL came out as Non-Binary and it was the first time she felt authentically himself. With the help of his supportive community, he began to embrace drag as a performance outlet to inspire and entertain. For SOL, everything in his life is centered around LOVE and LIGHT. 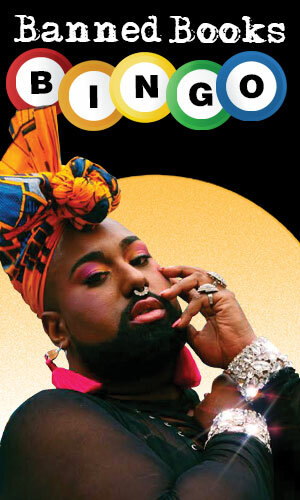 More recently, he was selected to perform at BUSHWIG where he lit up the stage with her impeccable lip syncs and jaw-dropping dance moves (catch his performance on his Instagram). Drag has become an outlet to inspire and be inspired, and the world better watch out because SOL is here hunny and is ready for the WORLD! Please Note: Limited food and drink (1 per ticket holder) will be provided. This event is 21+.